Come to NP McDonald’s Wed. Oct. 28, 5-8 p.m. for treats, not tricks! 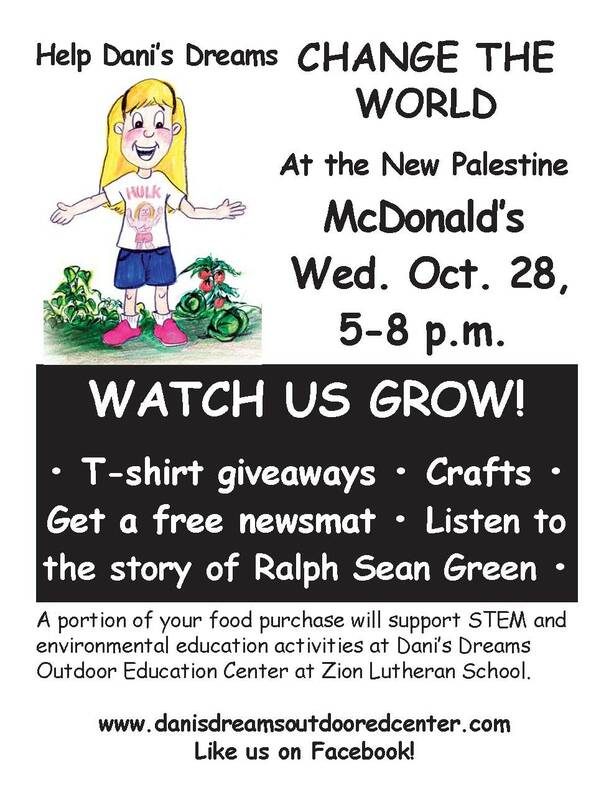 This Wednesday is Dani’s Dreams Night at the New Palestine McDonald’s, 5-8 p.m. Join us for T-shirt giveaways at 5:30, 6:30 and 7:30 and test your nature knowledge with our newsmat! There will also be a special reading of “The Adventures of Ralph Sean Green”. Enjoy a fun, family dinner and help Dani’s Dreams plant the seeds of science and STEM education in Southern Hancock County. We need your support to make it happen!